Sir Sean Connery's waxwork at Madame Tussauds has been given a brush up and a new costume ahead of the original 007's upcoming birthday. 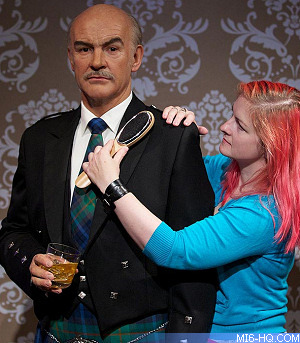 Connery's waxwork got a new patriotic Scottish look at the London attraction ahead of his 83rd birthday on Sunday (August 25th). The Tartan Society donated the New York Tartan kilt. The model was previously dressed in a smart casual check suit, coupled with a black polo neck. Wardrobe assistant Jane Anderson said: "I'm always working on new looks for figures and love the challenge of thinking of something different. For such a stalwart Scottish actor, to celebrate his impeding 83rd birthday, it had to be something special. He wears lots of different tartans, but has worn this one to the annual tartan festival in New York so it seemed fitting".